What size does it need to be again? It’s no secret that video content is more effective at getting engagement on social platforms! I mean, who doesn’t love a cat video! Personally, I like the option where you can spend more time on a strong creative & less time looking at a rendering bar! With option 2 being a clear winner we then have another problem! What format does my video need to be? 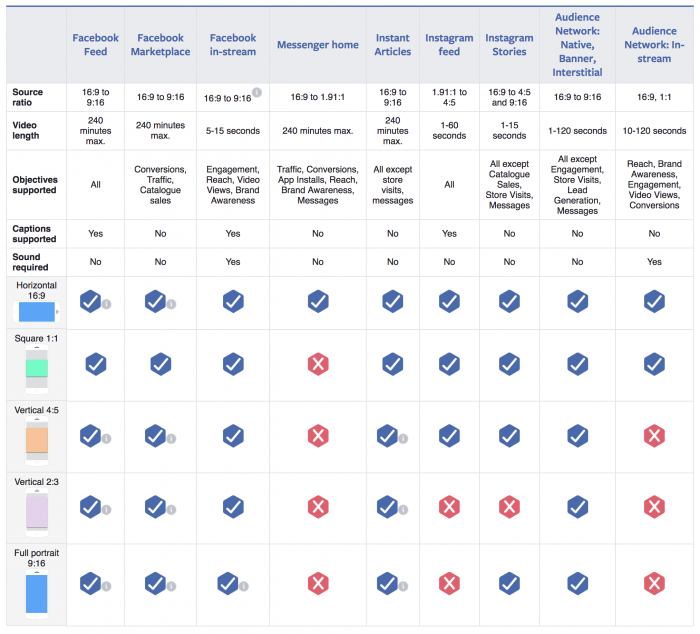 Until now, there’s always been conflicting resources BUT Facebook has finally put a definitive guide together, showing all the sizes, formats & video specs. The best thing about this guide is it will change as the platform updates & evolves, so it’s the only video spec sheet you’ll ever need. Being no longer constrained to the standard 16:9 aspect can be challenging at first ( especially when shooting live video ) but with more video content being viewed on a 9:16 aspect & Instagram launching it’s new IGTV app utilising exclusively 9:16 content, it won’t be long until the standard ratios are a thing of the past & content creators/advertisers & marketeers will have to adapt to this new format.